Combine the chia seeds, almond milk and maple syrup in a bowl, mix well. Refrigerate for at least 2 hrs. (or ideally overnight). The chia seeds will swell to around 9 times their original size. In a blender/food processor, mix the mango flesh with the cherries, lime juice and ice cubes until smooth (for a little more sweetness, add 2-3 tsp of maple syrup or honey). Divide the crème into 2 bowls. 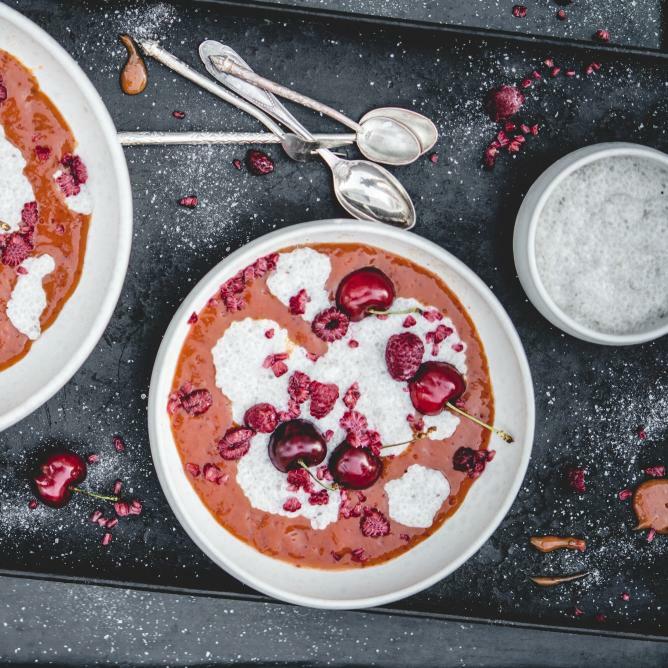 Stir the chia pudding again thoroughly, spoon onto the mango crème, break up the slightly defrosted raspberries straight over the bowls and scatter over the pudding. Different berries and/or cherries could be used as a topping. For the mango, it's worth buying a Primagusto mango. It should be very soft, with a nice, sweet smell.